Grease Monkey, Canberra's newest burger joint, opened today in Braddon. Lonsdale street in Braddon, once dominated by car yards and mechanics, is now flooded with hipsters and new eateries. Owned by veteran restauranteur, Socrates Kochinos (who also owns Belluci's, Cream, Public, Urban Pantry, Me and Mrs Jones, and the Academy nightclub) Grease Monkey pays tribute to the mechanical workshop that came before it. The burgers have names like "Full Service" and "Pitt Stop". The breakfasts are cleverly called "Jump start" and "Automatic". But it's not just the menu that reference the mechanic's shop. Much care and consideration has been put into the industrial-themed fit out. A roller door built over the pass resembles a garage. It's painted with a sign that says "Get your motor running". A shiny new bar takes up a significant portion of the indoor space, leaving some room for booths and high tables with stools. The rest of the seating is in the beer garden outside. Grease Monkey's Facebook page declares that they have "Burgers you'll go apesh*t over". It was a bold promise, so I decided I had to bring a burger expert (aka Macgyver Boyfriend) and put the Greasy burgers to the test. Macgyver Boyfriend ordered the Full Service ($17) and I ordered the Dirty Bird ($15). All burgers come with chips. The Full Service is essentially their "burger with the lot". It comes with a beef pattie, bacon, egg, cheese, tomato, beetroot, onion, and ketchup. If you weren't already aware of the American-style theme to this burger joint, the use of the word 'ketchup' throughout the menu should definitely tip you off. On the topic of ketchup, Greasys gets brownie points for having condiments on the table. Not enough establishments in Canberra have condiments on the table. I did lament the lack of barbeque sauces though. The burger itself was epic. I loved the amazing cross section and the even layers of ingredients. It was one of the most well-constructed burgers he and I had ever seen. He told me that the key to a good burger was whether the ingredients stayed in the burger while you were holding the burger. Not only did the burger stay together while being held, it stayed together after he put it down to get drinks, I picked it up for a bite (and photo!) and put it down, and then he picked it up again - still in one piece!! Incredible. What I loved the most about the burger was that the bun didn't overwhelm the burger. The worst thing about getting a burger with a massive bun is that the flavour of the filling gets lost in all that bun. I also don't normally like burgers with the lot. I feel like there is too much going on. I usually prefer more simple burgers, with a maximum of 3 different flavours. BUT. The Full Service was different. There wasn't too much of one ingredient. The problem with other burgers (lesser burgers) is that in one bite, you often get half of the total lettuce in one bite and a tiny bit of pattie. Or just tomato and bun. Or just cheese and pattie. There's not an even spread of ingredients in the one bite. The best part about the even layers in the Full service was that you got a bit of everything in each bite. It was the perfect bite, every bite. The only downside was that the burger was slightly too soggy for my liking. It was most likely from the fresh tomato, which probably couldn't have been helped. The Dirty Bird comes with southern fried chicken, lettuce, tomato, onion, cheese, and Greasy's sauce (turned out to be a mayo-based sauce). The crumb on the chicken was crunchy and the chicken was juicy and reminded me of a flavoursome chicken schnitzel (not southern fried chicken). I enjoyed the burger (and it was less soggy), but ultimately, I preferred the Full Service. We liked the subtle seasoning on the chips. There was enough that we knew we liked it, but it left us wanting more of the seasoning. So, did the burgers make us go apesh*t, like they promised? I think there's enough evidence to say yes for the Full Service and no for the Dirty Bird. The other burgers are yet to be determined! As for the milkshakes? Well, unfortunately, we were sorely disappointed. Today's milkshake sounded amazing - salted caramel and bacon flavoured ($6). It was presented in a takeaway paper cup with a plastic lid and straw. Don't they know everything tastes better in a mason jar?! But that's not what was disappointing about it. The milkshake was pre-made and brought out from the fridge. It was watery and didn't have a strong salted caramel flavour nor bacon flavour. And the floaty bacon bits in the drink didn't taste like bacon to me. A scoop of ice cream might have saved it. 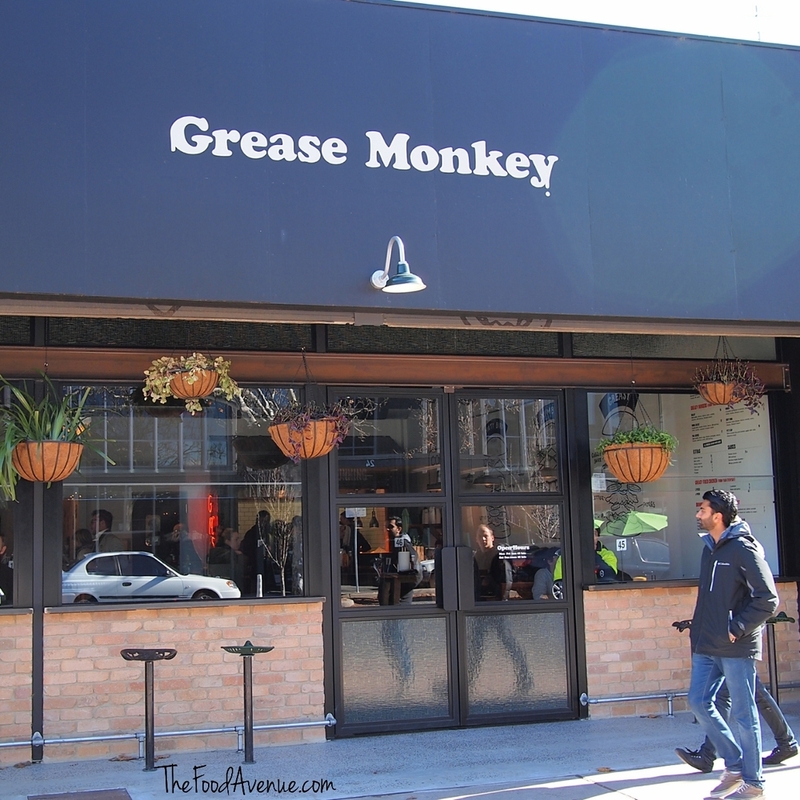 Have you been to Grease Monkey? What did you think? Did the burgers make YOU go apesh*t? If you like burgers, you might want to check out London Burgers in Belconnen! Located on the Batman St side of Gormon House Arts Centre, is the award-winning Sage Dining Rooms. Head Chef Damian Brabender is an approachable and friendly kind of guy - and he's changing things up at Sage. The kitchen comprises of Damian and three other chefs but they are taking dishes out themselves and talking to the diners about the dishes. It's easy to see his passion for food. His excitement is contagious. Chef Damian uses the freshest ingredients - from the Sage farm and straight from the Mint bar garden out the front of the restaurant. He's cultivating unusual produce to help create a unique dining experience everyday. Just some of the interesting ingredients include kohlrabi (turnip cabbage), chick weed (a leaf vegetable), nasturtium (an ornamental salad ingredient), and salty ice plant (a plant with glistening, succulent leaves). He uses these ingredients to create innovative dishes that are not too traditional and not too modern. The dishes are fun and whimsical, but relatable at the same time. And because the team are always experimenting, always developing new dishes - there's even more reason to visit more often and experience the evolving menu as the seasons change. The first plate for the evening looked like a small dish of bacon bits, but with a smell hot chips in the air. As it turned out, the dish is actually Sage's take on Salt & Vinegar Chips: on a bed of creamy hollandaise sauce - aerated by carbon dioxide - are crunchy potato crumbs. It's a familiar flavour that is elevated by incredible textures. The next plate of snacks are just as whimsical. Sitting atop a garden pea marshmallow is a pile of interesting-looking shavings. I wondered if it was homemade pork floss, as it seemed to have a fluffy texture, similar to the Asian dried meat product that looks a bit like cotton. The chef revealed it was ham that had been frozen and then microplaned. Chef Damian (who is allergic to tuna!) lives on the wild side every day to prepare an incredibly fresh Yellowfin Tuna Sashimi Taco topped with wasabi and a finger-licking good ABC aioli sauce (main ingredients being ABC kecap manis and mayonnaise). The light-as-air oyster mousse made a creamy topping for the crunchy tapioca-based cracker. Looking as pretty as a flower was the Rockmelon and Trout dish. The ocean trout was incredibly tender after it had been cured in sugar and then cooked in a water bath at low temperature. The rich and salty trout paired really well with the sweet, fresh rockmelon. Tying the dish together was the creamy avocado, wasabi and pine nut sauce. The beef tartare came with a very cute fried seaweed lid made of fried seaweed. The mixture of the raw beef with coriander and lightly pickled kholrabi from the garden, peanut praline and the ABC aioli instantly reminded me of a very fancy beef satay. A most impressive dish was a Heston-like dish. Out came what looked like sashimi. There was a light-coloured seafood on the left, and on the right was raw tuna, or that's what it seemed! Turns out it was lobster and watermelon! Given the lobster was completely cooked, this meant the dish was a completely safe option for pregnant women. The watermelon, which had been hickory smoked and somehow compressed, magically took on a "meaty" quality. Chef Damian said the watermelon cooked in this way could also be done to look like nigiri-style sushi where a piece of the watermelon sits atop a small rectangular mound of sushi rice. Forget about what you thought of stuffy fine-dining establishments. You don't need a special occasion to visit at Sage Dining Rooms. While the white tablecloths and fancy tableware give an air of sophistication, the dining experience is fun and dynamic. 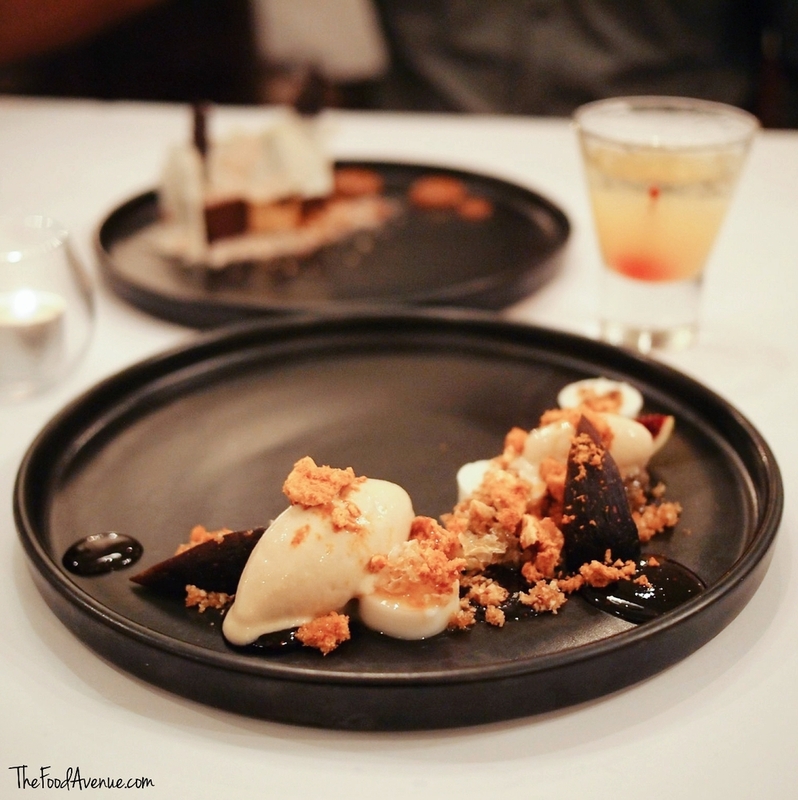 The menu is constantly being modified, with some dishes changing on a daily basis. This is particularly the case with Taste and Test where you get five surprise dishes for $75. It's being run for 5 weeks from 7 April - 7 May 2015 for lunch and dinner Tuesdays - Thursdays. Sage caters for all dietary requirements. Most dishes are gluten free as potato starch is generally used instead of flour. If you can't make it to Taste and Test, the easiest way to sample the best dishes is to take advantage of the Chef's Menu which gives you 5 courses for $95.00. Wine pairings are $45.00 and soft pairings are $25.00. The soft matches are unique and beautifully balanced drinks that won't feel like you're having less fun than those having wine matches. Both the Lime & Hazelnut Soda and the Vanilla & Strawberry Soda had a simple delicate sweetness that complemented the matching dish. Sage Dining Rooms are open for lunch and dinner Tuesday to Saturday. The restaurant is now also doing a 5-course brunch on Saturdays from 9:30am - 1:30pm, which includes ham hock, poached eggs, and milk cereal sorbet with fruit loop crumble. *I dined as a guest of Sage Dining Rooms but all opinions are my own.